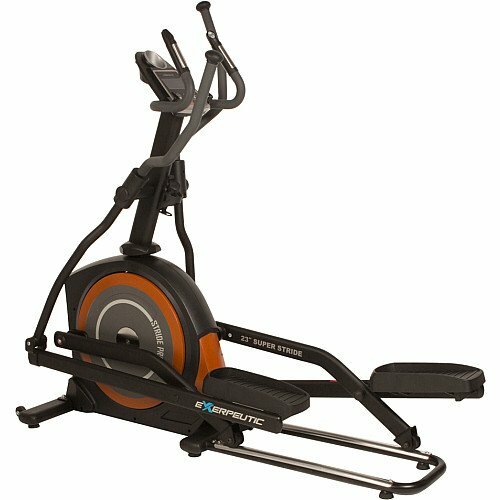 The Exerpeutic 650 Heavy Duty 23" Fitness Club Stride Programmable Elliptical has features like large LCD display, 23" Stride Length, dual action workout arms, dual sensor pulse pads, 6 level of Resistance. its unique design provides no stress on hips, ankles and joints plus adds the benefit of upper body exercising. This elliptical provides a super quiet workout and has a weight capacity of 350 lbs. Stride length of 23”for a better workout. Dual directional flywheel for frontwards and backwards workout capability. Transportation wheels let the product be moved around. Cast Aluminum rails will not scratch or dent providing for smooth striding..
ToughTrain 3.5 out of 5 Perfect for trainer your whole body under your home premesis. Available in an affordable price and has attractive warranties. *Note: Most of the sites, stores or shopping portals listed above sell Exerpeutic 650 Heavy Duty 23″ Fitness Club Stride Programmable Elliptical with discounts and other exciting offers. There is a possibility that the some of above websites are not selling Exerpeutic 650 Heavy Duty 23″ Fitness Club Stride Programmable Elliptical now. Toughtrain.com is not liable for such cases or instances. Also we do not recommend any seller for Exerpeutic 650 Heavy Duty 23″ Fitness Club Stride Programmable Elliptical and a buyer should buy from where he/she gets best deal with quality of products, service and on time delivery (shipment).